As you can see, the lion's share of the painting is now complete. Several afternoons were spent getting the model to this stage. 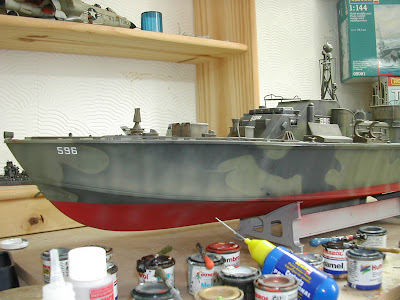 Each section of the deck, superstructure and hull have been carefully and minutely weathered to achieve an in-scale well-used appearance. This is very important as it will affect the overall appearance of the boat as well as being able to stand close inspection. 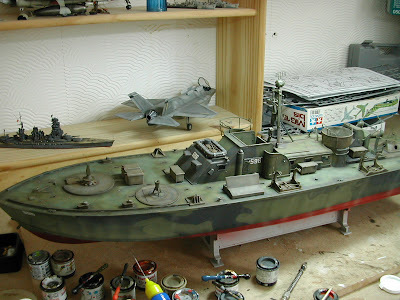 This will become apparent later when the weapons and deck fittings are added. So far, this has proved to be a very interesting and rewarding project. With round 70 hours logged already on this model, I think it gives an idea of the level of dedication required to complete a project on this scale. I haven't mentioned the huge enjoyment factor, which so far is around 11/10! 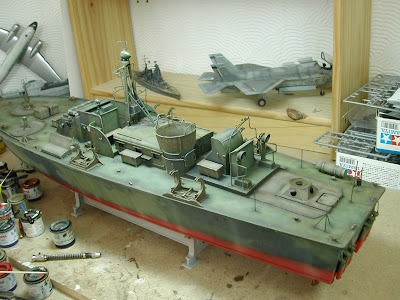 Hello Phil, I'm working on this kit right now,and found your blog through search of Italeri pt boat. Your boat looks real, which is what I am after. Did you pre-shade before airbrushing? Did you brush paint the camo? You have achieved a camo effect that is not too contrasty (the black for instance) Any chance you could share your techniques? Is there a wash or overspray to tone down contrast to look like reality? Great work. Thanks for any tips. I'm from Boston MA.